At the turn of the century, Hong Kong saw Fairy King Prawn, a son of Danehill, become the Horse of The Year in two consecutive seasons. In fact, Fairy King Prawn's racing career lasted only for three and a half years but his unprecedented achievements put Hong Kong racing on the map internationally. His career highlight came on 4 June 2000 when he partnered Robbie Fradd to land the Yasuda Kinen in Japan. Fairy King Prawn was not much fancied before the race, but he took the Japanese racing circle by surprise when storming home with a string of Japanese top milers behind him. Fairy King Prawn made history by becoming the first Hong Kong-based horse to win a G1 race overseas. Fairy King Prawn brought us the most exciting races in his duel with top Australian mare Sunline both in Hong Kong and in Dubai. In the 2000 Hong Kong Mile, Fradd was all out to drive Fairy King Prawn to pick up six lengths on Sunline within the final 400m. Eventually, the two horses dashed past the line almost at the same time although Fairy King Prawn went down by a short head. The two clashed with each other again in the Dubai Duty Free in March 2001. This time, Fairy King Prawn, also partnered withFradd, succeeded in taking revenge on Sunline but was beaten by Jim And Tonic bya neck. These two races have been some of the most talked-about ones in the past decade. 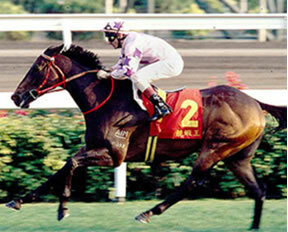 Fairy King Prawn held the Horse of The Year title for two consecutive years in 1999-2000 and 2000-2001. He was also voted the Most Popular Horse of the Year for three consecutive seasons (1999-2002). He started in 26 races in Hong Kong, Japan and the UAE with 12 wins and 10 seconds, earning over HK$37.7 million in stakes. He was out of the first three only four times in his career. In February 2003, his retirement to Tuen Mun Public Riding School was formally announced.